綜合 Stanley 同阿 Kong 既經驗﹐Hitec wing servo 肯定有質量控制問題。好彩有個共通點就係三隻有問題既 servo 都好早期就瓜﹐所以如果真係要用 Hitec wing servo﹐ 一定要裝落機前叫個 servo 玩舉重幾個鐘﹐如果個 servo 仲識郁﹐應該都會幾穩陣呱 . The digital servo (MG5125) that was burned while I was setting up my Trinity wasn't stalled at all! I turned on the system with all the servos in the neutral positions. The servo started to develop vibration after about 20s when the system was on. Then, only one or two seconds later it died with smoke of hell! The other digital servo on board the Trinity in Shek O was also developed some funny vibration only 20s in flight. After I have recovered the plane and gone back home, I checked the servo again (still powered by 5 cells battery), I found that it didn't move at all (looked like it was jammed but nothing was obstructing its movement anyway), and it produced a very strange loud mechanical voice. I immediately switched off the power. Few days later when I had free time, I modified the power system to 4 cells and switched on the system, then surprisingly the digital servo functioned again and it seemed back to normal. I carefully checked it again and again, and it looked completely ok! Anyway, I have no confident on this servo anymore and I decided to replace it with an analog one (MG125) - well, I have no other choice for ultra slim servo for the time being although I would say I am completely lack of confident on all Hitec servos! 大約半年前﹐Hitec 將D wing servo 劈價近 20%, 唔通佢地係將貨就價 ? Stanley, 今個星期六去唔去石澳呀﹖如果去就記住帶個隻識跳舞既 5125MG 同掃左牙既 125MG 出黎俾我。話時話隻 Trinity 個日只係慢速 spin 落去呢樹叢度﹐隻 125MG 點會掃牙架 ? http://www.gliderking.com/modules.php?op=modload&name=XForum&file=viewthread&tid=886 睇到呢個報告。睇黎同 Stanley﹐阿 Kong 有一樣遭遇既仲有好多人。共通點都係隻 servo 好早期就瓜,唔會捱得超過一個 flight. I bought four digital 5125's for my new Opus W and had a problem(s). As soon as I plugged one servo into the receiver for testing the servo was very jittery and would not center. I was able to return the servo with out any problem to my local hobby shop for an exchange (lucky for me I didn't' glue them in yet). However, I noticed after I glued all four servos in (including the replacement servo) one was very noisy as if it was having difficulty finding a position without any tension on the arm. It was always making a humming sound no matter what. First flight went smooth with out any apparent problems. All servos were trimmed and operating normal. Second flight: Big Problem, My plane started flying very weird, so I brought it around for a hard landing that was beyond my control. The noisy servo, which was in my flap bay had malfunctioned. It was so toasted that the servo motor sticker and housing where bubbling from the heat caused by the malfunction. It damaged my top wing skin with an ugly burn mark where it was glued (which looks like a cigar burn mark). Other damages occurred to the wing as a result from the hard landing. Although these are first set of Digital's I owned, I don't want to sound like I am criticizing 5125 servos but for what it's worth I like the performance and toque these little servos have for the money. They have no gear slop that I can see and center every time I turn my radio on. I am sorry that we have had your servo so long. After looking at it with the technician and reading your description, I can only assume the motor went out. How this happened is very difficult to determine. I told the tech to replace the servo and I am sending you another one as compensation. Though I don't normally do this, I felt it was required this time. The 5125 servos have been very successful for us and are gaining acceptance in the soaring community due to slim packaging and strength. I think the one you had was a fluke and the rest should serve you well. If anyone has had similar problems please post it for our fellow flying buddies who might be in the market. I hope it was a streak of bad luck with the servos because I just put the new servo back in and I am going flying today. In fact, I had similar jitter and failure to centre problems in one of my 81MG servo after the initial setup. It produced very loud mechanical sound and become very hot. I had no alternative but to removed it with extreme difficulty. I think Hitec knew about the problem as there are so many complains recently. From what I see is they just deny it for the sake of corporate image. Even though they know it is their fault probably in the design or in the manufacturing process, they just hope that that problem will fade away. I am sure if the return rate is getting higher, there will be more damage to their image rather then admitting it now. I think they should admit the fault and recall all the unreliable servos. You know flying a sailplane is just like driving a car, if an item on board is malfunction, the consequence can be VERY serious! It seem to have a lot complains about Hitec servos. What happen to their new design? In the pervious decay, their servos were cheap & strong. Almost all servos in my F3F sailplanes are HS-85MG. In recent 2 years, I start to fly F3D, I also use HS-85MG in the wing. I crash more than 10 F3D planes. At 2-3 times, the speed during crash were over 200Km/h. 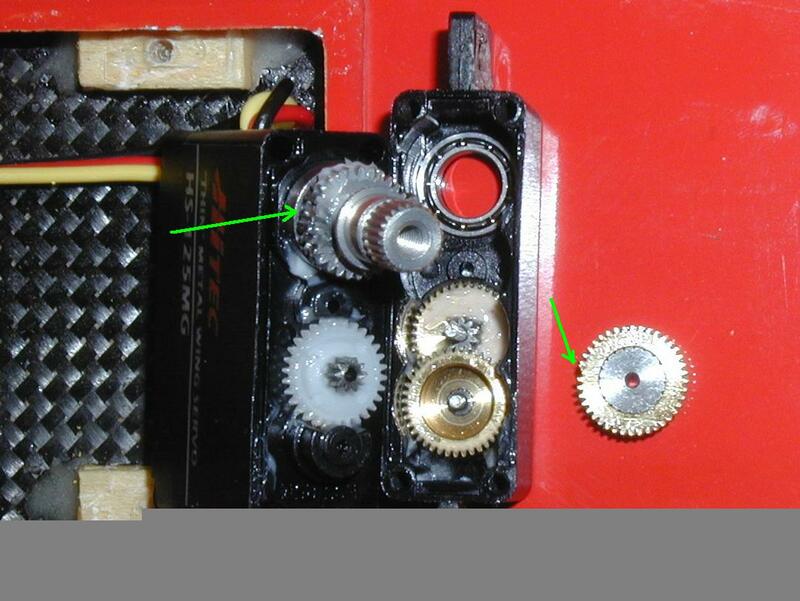 These 2 wing servos still survive without damage a single gear (total 10 F3D). I think Hitec should play more attention to thier new products. 各位機除咗 Hitec 啲 Wing servo 外仲有什麼其他選擇呢? Last edited by CM Cheng on 23 Mar 2004 05:44 pm, edited 1 time in total. "unbreakable". What's a joke! I think they should be liable for their claim!!! Anyway, the gear is too expansive, cost at least US$26 each - stupid money sucker!! I guess I will give them up all and never touch Hitec product again. Stanley, 老實說我都有些不能相信，HiTec 真的是這麼差劣? 我還有四隻 5125MG 未用，難道真的只可用來推 rudder? 5125MG 的 servo 牙灰灰色的，像是鋁合金之類，若然則應不能承受太大衝力，但都不應該這麼易就掃 (加上它有膠牙保護 )，我有點懷疑質量控制有問題，Stanley, servo 上應有生產日子，壞 servo 是否同期生產?